Viruses and other microbes that cause infection are increasingly identified only through their genetic signatures. Real-time qPCR is the industry standard for DNA analysis, and fluorogenic probes with Black Hole Quencher (BHQ) dyes* are the gold standard for pathogen detection in qPCR. Public health agencies depend upon real-time qPCR for single-molecule sensitivity and impressive dynamic range in their most urgent monitoring programs. To assist in probe and primer selection, LGC Biosearch offers RealTimeDesign™ (RTD™) software. RealTimeDesign software is a free, web-based assay design application for real-time qPCR that can design probes and primer sets to resolve non-standard pathogens and emerging threats. Technical excellence in oligonucleotide synthesis has established LGC Biosearch as the preferred OEM supplier to government laboratories and biodefense contractors. LGC Biosearch’s manufacturing facilities have ample capacity to ramp up production and meet the urgent demands of the medical community, even during a pandemic. Rapid and precise production is important for robust assays that guard the public health. LGC Biosearch gains manufacturing efficiency through careful control over raw materials: phosphoramidite dyes, quenchers, and solid supports are synthesized in-house as essential precursors for oligo synthesis. 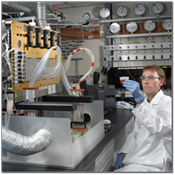 LGC Biosearch’s unique synthesizers enable high-throughput oligo synthesis, while automated robotics dispense probes and primers into exacting formulations. LGC Biosearch Technologies is the source of BHQ® Probes. The Black Hole Quencher dyes are renowned for versatile quenching across the visible spectrum, and without native fluorescence of their own. FRET and static quenching mechanisms allow for pairing with a wide range of reporters, including the CAL Fluor® and Quasar® fluorophores invented at LGC Biosearch. BHQ Probes incorporating these fluorescent reporters achieve excellent signal-to-noise values and expand multiplexed analysis to include reference genes, internal positive controls, or even distinguish a group of organisms. For these reasons, BHQ Probes fuel the microfluidics of field-deployed instruments and are critical reagents in surveillance laboratories that detect and quantify pathogens. In fact, the CDC included BHQ Probes as an integral component in their 2009 H1N1 Panel to detect and identify cases of the novel influenza A (H1N1) virus. Stellaris RNA FISH is an RNA visualization technology that allows for simultaneous detection, localization and quantification of individual RNA molecules, including viral RNA. Transcript counting within a cell or tissue is made possible by tiling up to 48 fluorescently-labeled unique probes along the RNA target. The combined fluorescence of these fluorphores binding together along the target produces a single punctate spot which can then be quantified using available software. Stellaris RNA FISH probe sets targeting viral, bacterial and pathogen RNA account for about 13% of publications citing Stellaris RNA FISH and can detect viral RNA within host cells as well as unique segments comprising whole virus particles. In response to the recent Zika virus outbreak, we are now offering professionally designed RNA FISH Zika virus probe sets, one against the + strand, and one for the – strand. See the publication highlight below. Custom probe sets can be designed against almost any RNA target using our free online designer or search our professionally designed DesignReady probe sets and ShipReady positive controls. There is also a Stellaris buffer set to streamline your workflow. For more information about this technology view this informative Stellaris video that contains 3 segments: introduction, animated RNA FISH mechanism, and interview portion discussing the applications of Stellaris FISH. Stellaris RNA FISH probe sets have been used to detect or study the following viruses. See publications featuring Stellaris targeting virus, bacteria, and pathogens in our Citation Center. Primary Human Placental Trophoblasts are Permissive for Zika Virus (ZIKV) Replication. Aagaard et al. Nature Scientific Reports. 2017. Brief Description: The authors used our professionally-designed Zika Stellaris RNA FISH probe sets to show that primary human placental trophoblasts can be infected by Zika-FLR virus and are permissive to viral RNA replication. Following infection, the primary trophoblasts expressed ZIKV cell entry receptors and continued normal cell function and differentiation. Importantly, these observations suggest that the ZIKV-FLR strain can replicate in human placental trophoblasts without disrupting normal cell function and thus suggests that these cells are likely serving as a permissive reservoir and transmission portal. Please reach out to techsupport@biosearchtech.com for any specific inquiries or to info@biosearchtech.com for help with ordering.